More than anything, we want to help you achieve your goals. At Dudum Chiropractic, we promise to listen to your concerns and help you understand your assessments and test results. We will listen and provide you with a suggested care plan to help you get where you want to be. Whether your goal is to be free of pain, lose the extra weight, or improve your athletic performance, we are here to provide you the tools and the support you need to reach your goals. Dr. Dudum is proud to offer a variety of services to help you reach your goals and address a wide range of health concerns. Family chiropractic care for relief and wellness. Massage to help you relax and feel incredible. Nutrition care, including a healthy detox plan to feel your best. We’ve created an incredible, state of the art welcoming atmosphere for you. And right now, you can schedule your first visit with us for just $39! This includes a consultation with Dr. Jd Dudum, a comprehensive examination and your first chiropractic adjustment. So, what are you waiting for? Use the form below to request your appointment now! Dr. Dudum is a wonderful chiropractor. I am back playing golf after being treated by him. He solved my back pain problem in a short time! He is very personable and has great knowledge of chiropractic care. His staff are friendly, warm and professional. I highly recommend him to anyone looking for an active lifestyle. I liked the fact that I wasn’t just brought in to crack my back but evaluate my situation and come up with a game plan to fix it. The initial process was straight forward, quick and easy. Everyone was very warm and welcoming the entire time. The constant positive energy that all the staff have reflects greatly on the office and how the practice is run. Dr. Dudum truly is the best chiropractor I have known. I highly recommend him for athletes, mothers, pregnant women, and anyone who truly wants to improve their movement and reduce injury. Dr. Dudum was very professional. He listened carefully to my concerns and provided feedback and answers to my questions. JD’s knowledge and attention to detail helped alleviate symptoms I have been dealing with for years. He has been spot-on with his treatment, and I will absolutely continue my treatment with him. I would definitely recommend him as a Chiropractor! 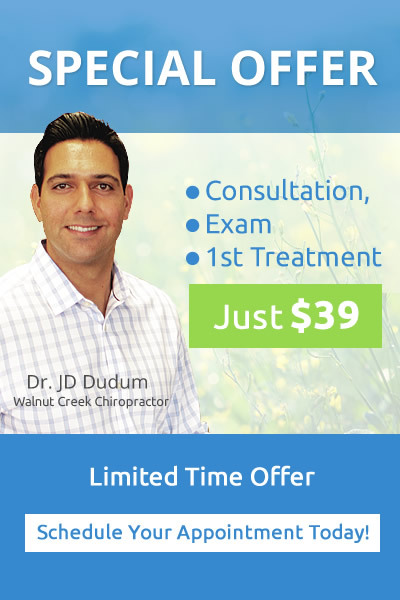 Happy to have found JD Dudum Chiropractic. Wonderful, feeling much better and hopeful that all my joint pain will soon be a distant memory. He is committed to fully resolving patients pain so that they do not have to be chronic repeaters, a criticism of the field. You can’t fake this kind of authenticity, care and knowledge! Becoming a patient at Dudum Chiropractic has changed my life! I feel better than I ever thought possible, and feel 20 years younger. Priceless! Thank you! I like the upbeat feel of the office. Everyone is friendly and comfortable to be around! Dr. JD always relieves my pain! He understands what hurts, where and how to fix it fast! Not only was my consult excellent but I have relief after my first adjustment appt. Also his treatment plan was very reasonable to get me back in shape. Dr. Dudum is personable, professional and really helped me! I have no hip pain now and could barely get out of bed or walk when I first met with him. I appreciate the professionalism and genuine care that Dr. Dudum and his team has showed me. I am so glad that I became a patient here. Thank you! Front desk staff are outstanding! Dr Dudum you are an excellent chiropractor thank you for your help. Dr. Dudum is wonderful at his practice. He pays attention to details to help diagnose the issues affecting ones’ body, and carefully listens to your concerns, leading to effective treatment. His care really helped me from my first visit on.